Adolescence should be a time of mental, physical, social, and emotional growth. It is during this time that higher levels of thinking, sometimes called executive function, develops. But, adolescence can be a difficult time, fraught with challenges. During this time the child transitions to young adulthood; including the development of intellectual, psychological, physical, and social abilities and characteristics. There are so many changes occurring during this time that the child can feel overwhelmed and unable to cope with all that is required. Mindfulness training has been shown to improve emotion regulation and to benefit the psychological and emotional health of adolescents. Most measures of emotional responding are self-report subjective measures. The electrical responses of the brain, however, can be used to objectively measure emotional responding and attention. Evoked potentials are brain electrical responses to specific stimuli. The P3b response in the evoked potential is a positive going electrical response occurring between a 4.2 to 5.2 tenths of a second following the target stimulus presentation. The P3b response is thought to measure attention to emotional stimuli. In today’s Research News article “Effects of school‐based mindfulness training on emotion processing and well‐being in adolescents: evidence from event‐related potentials.” (See summary below or view the full text of the study at: https://www.ncbi.nlm.nih.gov/pmc/articles/PMC6175003/ ), Sanger and colleagues obtained the cooperation of 4 secondary schools and recruited 16-18 year old students from each. 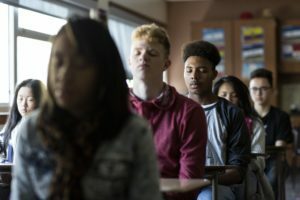 The adolescent students from two schools received mindfulness training while the adolescent students from the other two schools were assigned to a wait list. Mindfulness training occurred in 8, 50-minute sessions over a month in the regular school day. They were measured before and after training for mindfulness, stress, depression, empathy, health and acceptability of the program. In addition, the students’ Electroencephalogram (EEG) was recorded while their attention was examined with an emotional oddball task. They watched a screen where the same two faces with neutral expressions were presented repeatedly, 80% of the time. Different happy or sad faces (oddball) were presented 20% of the time. The students were asked to press a space bar every time a happy or sad face appeared. The change in the EEG evoked by the faces was recorded as well as the speed and accuracy of the students’ responses. In particular the P3b evoked response was targeted. It consists of a positive going change in the evoked potential occurring 420-520 milliseconds after the stimulus. It is associated with attention to emotional stimuli. They found that the size of the P3b evoked response to both the happy and the sad faces decreased over time in the control group suggesting a loss of responsivity to emotional stimuli (habituation) in the non-trained students. On the other hand, the size of the response did not decrease in the trained students, suggesting a lack of habituation, a maintained responsiveness to emotional stimuli. In addition, they found that the mindfulness trained group had fewer visits to the doctor for psychological reasons and increased overall well-being. These are interesting results that suggest that mindfulness training help to maintain the adolescents’ attention to emotionally relevant stimuli. This may be helpful in maintaining socially appropriate responses to other peoples’ emotional expressions which would tend to improve social ability. This could be of great benefit during the awkward times of adolescence. In addition, the training appears to reduce psychological issues and improve the students’ well-being. So, improve emotional responding in adolescents with school-based mindfulness training. Mindfulness training was associated with maintained P3b mean amplitudes to facial target stimuli, indicating sustained sensitivity to socially relevant, affective stimuli. Trained students reported higher well‐being despite mindfulness course engagement being correlated with greater stress awareness. Self‐reported changes in empathy correlated significantly with changes in P3b to emotional faces across groups. In a non‐randomized controlled study, we investigated the efficacy of a school‐based mindfulness curriculum delivered by schoolteachers to older secondary school students (16–18 years). We measured changes in emotion processing indexed by P3b event‐related potential (ERP) modulations in an affective oddball task using static human faces. ERPs were recorded to happy and sad face oddballs presented in a stimulus stream of frequent faces with neutral expression, before and after 8 weeks of mindfulness training. Whilst the mean amplitude of the P3b, an ERP component typically elicited by infrequent oddballs, decreased between testing sessions in the control group, it remained unchanged in the training group. Significant increases in self‐reported well‐being and fewer doctor visits for mental health support were also reported in the training group as compared to controls. The observed habituation to emotional stimuli in controls thus contrasted with maintained sensitivity in mindfulness‐trained students. These results suggest that in‐school mindfulness training for adolescents has scope for increasing awareness of socially relevant emotional stimuli, irrespective of valence, and thus may decrease vulnerability to depression.